The Lunaqua 10 Cable Splitter is designed for use with Lunaqua 10 LED Spotlight and 7.5m 12V Connection Cable only. The Cable Splitter features 1 cable entry and 2 cable exits to allow the low voltage 7.5m Connection Cables to be extended or split for connection to additional Lunaqua 10 LED lights. Up to 15 Lunaqua 10 LED Spotlights can be added to the UST150 Underwater Transformer using the Cable Splitters. Fully submersible IP68 Cable Connector. 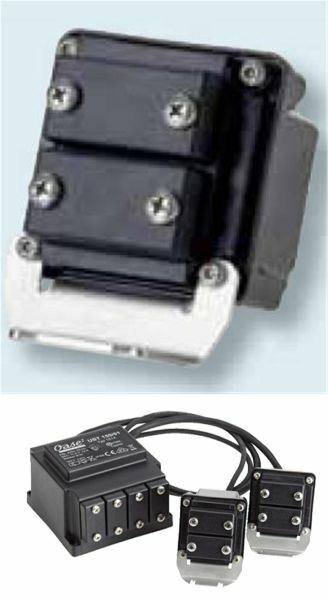 Can be used to increase the amount of LED Spotlights on the Underwater Transformer. Features special terminals specifically designed for the Lunaqua LED Spotlights and 12V Cables. Total length of Lunaqua 10 Connection Cables in use must not exceed 60m per transformer outlet.